Finding ways to emphasize the subject is all too important in composing an image. Creating a center of interest not only provides a focal point, but it forms the overall theme of the image and its structure. Another component to composition is organization. What elements the artist decides to leave out is just as important as what is left in. It is necessary to edit even before opening the shutter. The elements in the image are there to strengthen the overall theme, if not they will only serve to diminish it. Should the artist have gotten closer? Farther away? Should they have used a simpler background? Would selective focus enhance the subject? Does the horizon placement improve the image? Do you feel a sense of balance? Are all the elements in the image working together? Are there elements that should have been edited out? Has the artist used the rule of thirds? 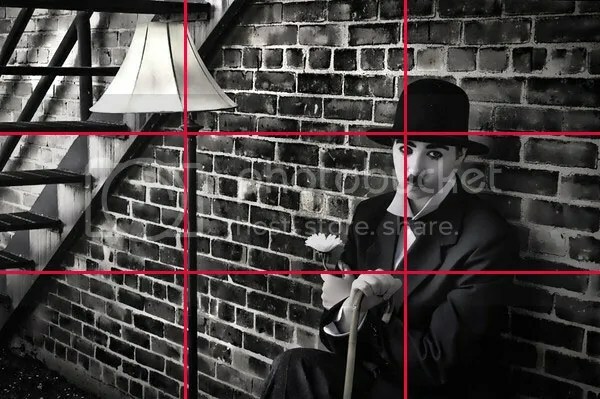 The rule of thirds is a simple composition technique to help create a balanced division of space within the frame. Imaginary lines are drawn dividing the image into thirds both horizontally and vertically. You place important elements of your composition where these lines intersect.